COMP Cams® Shaft Mounted Rockers feature 8620 steel pedestals and shafts that have been deep case-hardened and tempered for maximum wear resistance and strength. These super-tough shafts provide a stable and accurate pivot point for the rocker arm bodies and increase the rigidity and structural integrity of your cylinder heads and valve train, making them ideal for ultra high-horsepower race engines. COMP Cams® precision-manufactured 2024 aluminum shaft rocker bodies exhibit brute strength and fatigue resistance and are designed to provide trouble-free performance in even the harshest environments. The full roller design dramatically reduces friction for unmatched horsepower production. 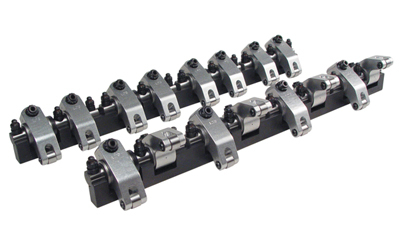 COMP Cams® Shaft Mounted Rocker Arms feature oil passages that feed pressurized oil to the shaft bearings and roller tips of the rocker arms for the maximum possible service life. As an added benefit, an additional oiling passage* provides a continuous stream of cooling oil to your valve springs for reduced fatigue and extended spring life. Our shaft mounted rockers also deliver rock-stable valve adjustments with the largest adjuster screw in the business; the oversized 7/16” screw features a 3/16” hex socket-eliminating twisted adjustment keys forever. Field-tested and proven by experts in every type of racing, COMP Cams® Shaft Mount Aluminum Rocker Arms are the ultimate rocker arm set up for all-out race applications. From NASCAR to professional drag racing, COMP Cams® Shaft Mounted Rocker Arms have proven to be the most effective way to increase valve train stability and eliminate horsepower losses and rocker arm failure. FREE SHIPPING at Brute Speed!! !